To become a good golfer, you have to have a good swing. There is no way around that truth. You putting and short game are all built out of your swing. There might be golfers with a good swing and a mediocre short game, but that means they haven’t practiced the short shots enough. There are few players with a bad swing and a good short game. Getting your swing down is the key to the rest of golf. Recreational golfers need to keep it simple. All our swing needs to do is hit the ball a reasonable distance and keep it in play. From that simple skill unfolds an enjoyable game. 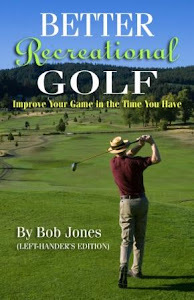 I will describe a recreational golf swing, but in order to truly learn it, you need to have a series of lessons from a professional who can take you from where you are to where you are capable of going. Before you start your swing, your grip, stance, posture, ball position, and alignment must be correct. If these are off, nothing that comes next has meaning. Since it takes no athletic skill to get these right, there is no reason that you should not do so. The backswing is designed to get the clubhead in position to hit the ball accurately and powerfully without making compensations. It should be no more complicated than turning away from the ball and lifting the hands to about shoulder height. The right forearm rotates naturally so that the angle in the right wrist stays the same as it was at address. The downswing starts with turning the entire right side. The left side is along for the ride for now. The angle between the right forearm and clubshaft does not change. As the arms lower, think that you are dragging the shaft across in front of you, directly at the target, but keep turning as you do this. When the hands fall below the hips and into the hitting area, keep turning. The momentum of the swing begins to open up that angle and whips the clubhead through the ball on its own. The hands do not need to help out. The moment after the ball is struck the left forearm will start rotating, like the right forearm did on the backswing. Continue turning to where your follow-through takes you. Simple to describe, difficult to do without an educated eye to correct you along the way, but that’s how it’s done. Good golf is not difficult if you keep it simple. 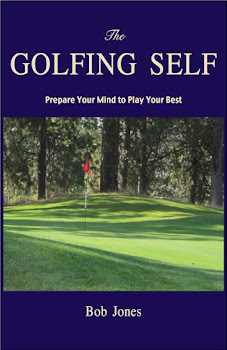 How to play creditable golf even though you're busy with family and career. Click image to purchase at Amazon.com. Copyright 2009-2012 by Bob Jones. Powered by Blogger.